Zimbabwe lawyers have taken to the streets to protest against the alleged abuse of rule of law by the State. 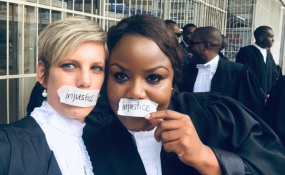 Cape Town — Zimbabwe lawyers have taken to the streets to protest against the alleged abuse of rule of law by the State. "So proud of my professional colleagues today. Restore the rule of law and constitutional democracy. The army must go back to the barracks," prominent lawyer and opposition politician Fadzayi Mahere tweeted. Human rights watchdogs in Zimbabwe have strongly criticised authorities for using troops to quell demonstrations. Zimbabwe's Human Rights Commission (ZHRC) has accused security forces of systematic torture, raising fears that the country is reverting to the authoritarianism that characterised the rule of President Emmerson Mnangagwa's predecessor, Robert Mugabe. Child Rights International Network says minors have been persecuted. In Zimbabwe "Children as young as 11-years-old have been detained on frivolous charges" related to recent protests, flaunting the government's lack of respect for their right to freedom of assembly, they said in a statement. Lawyers and activists say police and soldiers have killed at least a dozen people, wounded scores and arrested hundreds since protests began following a hike in fuel prices. Police say three people died during the protests. "I am proud to have this astonishingly brave and competent human rights lawyer Beatrice Mtetwa as my friend. Here she is preparing to march with other lawyers in Harare today to protest the subversion of due process by the Judiciary in #Zimbabwe. Be safe," tweeted opposition politician David Coltart. Before winning a contested election in July, Mnangagwa promised a clean break with the 37-year rule of Mugabe, who used the security forces to quell civilian protests.